Restaurant & Foodservice Flooring – The flooring treatments selected in restaurants, bars, and food court areas must consider a number of functional and aesthetic considerations. Typically, these facilities operate long hours with high traffic volumes, exposures to wetness, foodstuffs, as well as aggressive cleaning & sanitation agents. They routinely must meet very high standards in hygiene and sanitation, with enhanced protection against microbial growth to prevent any cross-contamination with its food & beverage items. The flooring finish needs to be extremely durable and low maintenance. Non-skid resistance is critical for preventing slip & fall incidents. In public areas, the systems need to offer hard-wearing functionality with design flexibility for unique, stylish options. 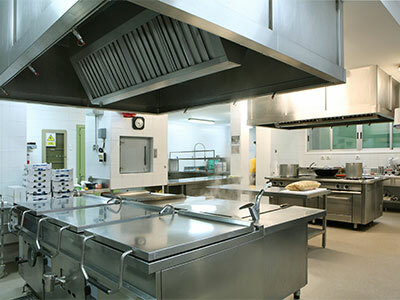 A commercial kitchen flooring system must endure harsh punishment from high foot traffic, hot grease & oil, steam cleaning, power washing, dropped pots, pans & food prep tools, as well as routine exposures to caustic by-products from processed foodstuffs, aggressive cleaning solutions and sanitizing agents. These high-performance, non-porous, seamless polymer systems must offer excellent chemical, stain, abrasion, impact, thermal shock & cycling resistance. Non-skid resistance is critical due to the routine exposure to wetness, yet the floor surfaces must balance non-slip traction with ease of cleaning & maintenance. Integral cove base brings the flooring system up onto the wall for a completely seamless solution. 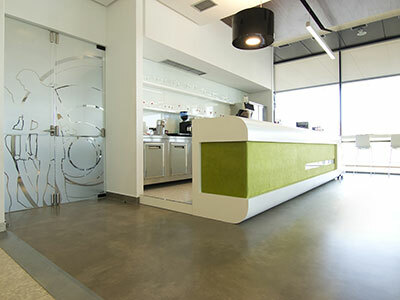 Treated with Microbe◊BLOK, our kitchen flooring systems become fortified protection against microbial growth. These safe, hygienic and attractive systems are engineered to provide years of lasting service. 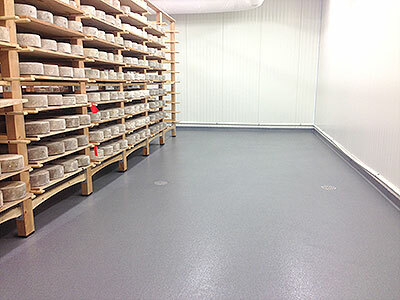 Freezers and cold storage require specialty floor resurfacing systems that can be installed at lower temperatures and in damp conditions, as well as cure in a relatively short turnaround time to reduce the client’s downtime and the associated risk of food spoilage especially in renovation or refurbishment projects. The systems must also have low odor, avoiding any tainting of stored foodstuffs. These storage areas require hard-wearing, seamless and non-porous floor resurfacing systems with added microbial protection against bacterial attack as well as non-skid texture to prevent slip & fall accidents when surfaces are wet. 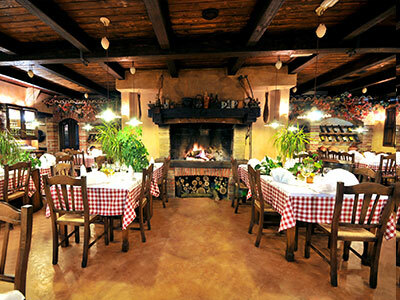 Dining areas are typically multi-purpose spaces exposed to considerable activity with heavy foot traffic, dragging/scuffing/scraping of chairs & tables, as well as drops and spills of foodstuffs throughout any given day. A seamless, non-porous floor coating or resurfacing system selected in these areas will need to provide both functionality and aesthetics. The flooring system needs to be waterproof and hard-wearing, with excellent impact, stain, and abrasion resistance. Ease of cleaning and maintenance are critical factors considering the long operating hours for meal service. Added hygiene and sanitation can be built into the polymer coating with Microbe◊BLOK, an antimicrobial film preservative. Unlike conventional vinyl composite flooring, a resinous flooring system does not require the long-term life cycle costs associated with waxing, buffing, and chemical stripping. As far as aesthetics, ProREZ offers an attractive range of stylish design options in various colors, patterns, and textures to complement any décor. The back bar areas require a seamless flooring system that’s hard-wearing with excellent impact and abrasion resistance. Integral cove brings the polymer coating up onto the wall for a completely seamless, waterproof solution for ease of cleaning and maintenance. Non-skid resistance ensures a safe working surface when exposed to wetness. Front bar, cafe, and sitting areas are typically multi-purpose spaces exposed to considerable activity with heavy foot traffic, dragging/scuffing/scraping of chairs & tables, as well as drops and spills of beverages and other foodstuffs throughout any given day. A seamless, non-porous floor coating or resurfacing system selected in these areas will need to provide both functionality and aesthetics. The flooring system needs to be highly durable and hard-wearing, with excellent chemical, stain, and abrasion resistance. Ease of cleaning and maintenance are critical factors considering the long operating hours for in-service periods. Added hygiene and sanitation can be built into the polymer coating with Microbe◊BLOK, an antimicrobial film preservative. As far as aesthetics, ProREZ offers an attractive range of stylish design options in various colors, patterns, and textures to complement any décor. 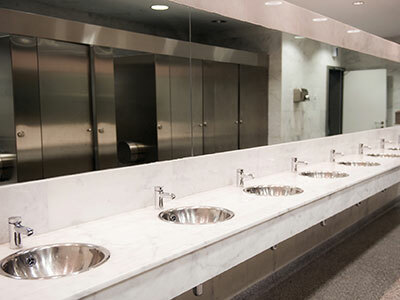 Public restrooms are areas that receive a lot of foot traffic, and often exposure to wetness. The resinous flooring system selected for a restroom needs to be highly durable, easily cleaned, hygienic and slip resistant. The waterproof surface will also provide long-term chemical, stain, and abrasion resistance. To complement the rest of the facility’s décor, and to project a clean, fresh image, ProREZ offers a broad range of decorative options in various colors, patterns, and textures.